QuickScore Elite Level II is Sion Software's premier software for composing music - a powerful and integrated 48-track scoring, audio and sequencing program together in one package. This is the program that Electronic Magazine awarded their 1998 Editors' Choice for notation software upon its debut and has won the Top Ten Reviews Gold Award for the past four years running. Edit your music using your choice of score, piano roll, controller, event list, audio or song editors, all included and all fully integrated. Once you understand one editor, you automatically understand the others. QuickAudio, a digital audio file editor, is included. VST instruments, audio and MIDI effects are supported. Print on any Windows-supported printer. Version 2008 includes unspecified updates. 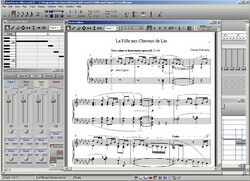 Editing: Up to 48 tracks * Editing windows include Score, Piano Roll, Controller, Audio, Event List, Song, Track Sheet, Mixer and Comments * Comprehensive set of standard editing commands in all editors including Cut, Copy, Paste, and Undo * Complete control over all MIDI events * Rich set of notation editing commands including transpose chromatically or in the key, adjust enharmonic note spellings, assign notes to different voices or staves, automatically set the duration of notes to fit musical passages and many more * Global graphic arranging options to cut and paste sections of songs * Intelligent edit filters * Loop editing. Recording and Synchronization: Real-time and step-time recording or record while tapping tempo from MIDI keyboard * Digital audio recording * MIDI from audio files * Real-time 16 channel MIDI mixer controls which respond to all MIDI controllers, including volume and velocity * Punch In/Out * SMPTE/MTC and Midi Clock synchronization * Optional automatic quantization of real-time recording * Input and controller filters for real-time recording. Playback: Playback through MIDI and all popular sound cards * Scrolling playback with synchronized window display * Repeats and first and second endings automatically play * Interactively edit in full-score, single-track, piano-roll, song-overview, event-list or graphic controller formats as the music plays * Play standard WAVE digital audio files * Track Sheet to mute or solo tracks and change sounds. Musical Symbols: Complete set of symbols including groupings, fingerings, articulations, slurs, repeats, crescendos, decrescendos, dynamics, line and box drawing * All standard clefs including 5-line and single-line percussion clefs * Grace notes and cue notes with automatic beaming * Configurable chord names, guitar chord grids and figured bass. Importing and Exporting: Import and export standard MIDI files * Import and export MusicXML files * Import NIFF files * Import Wave files * Export MP3 and Wave files * Export Copyist files * Export Tiff, BMP, EMF and EPS files. Plugin architecture: Support for VST plugins including audio effects, software synthesizers and MIDI effects. Multimedia: Record and play back multiple tracks of digital audio * synchronize with digitized movie clips for film scoring * create audio CDs, MP3, Wave files and music soundtracks and incorporate them into digital films, videos and games. Audio Editor window: The Audio Editor can be used to edit audio data such as vocals or sound effects. As many tracks as can fit on the screen can be seen at once. At the left are the track names and each track’s audio data are shown to the right of the names. QuickAudio: QuickAudio lets you edit, play and record digital audio as well as convert between various popular audio formats. It has standard audio editing features, audio spectrum analysis as well as support for up to 24 VST plugins. VST Plugins: VST plugins extend QuickScore's functionality in many different ways. You can load new virtual software synthesizers, drum kits and orchestral sounds not available on your sound card, and manipulate them in unbelievable ways. You can edit and morph your audio, and generate new MIDI or audio material to go with music you've already entered. Audio to Notation: Extract notes from audio data. The notes are inserted into the track containing the audio data and can be displayed and edited using any of QuckScore’s note editors. Easier drum tracks: In the Piano Roll Editor simply click on the Show Drum Names button to show the drum name associated with each pitch. Click on it again to hide the drum names. A Windows-compatible sound card or MIDI interface is optional.